From RedState.com, By: Daniel Horowitz, March 7th, 2013 – What was it about Rand Paul’s filibuster that has captivated conservatives all over the country and reinvigorated their desire to fight for our Constitutional Republic? The irony is that the drone issue was not even one of the most popular issues among many conservatives until last night. I suspect that many conservatives don’t necessarily agree with some of Paul’s assertions about targeting terrorists like Al-Awlaki overseas, although we are all (everyone except for McCain and Graham) concerned about targeting Americans on American soil. Yet he has become an overnight sensation, not just among his core libertarian base, but among the broad conservative movement. Conservatives have been starving for a fighter; longing for someone who will do something drastic, engage in a media savvy fight against an imperialistic president who has no respect for checks and balances and an invidious disregard for the separation of powers. We have witnessed this president shred the Constitution and implement his radical agenda by administrative fiat. We the People stand by flummoxed and frustrated at the lack of courage among Republicans to counter the president with anything more magnanimous than a press release. We have seen him abrogate our immigration laws, grant administrative amnesty, and let criminal aliens out of jail. Yet nobody has used their position and identified a point of leverage at which to take a stand and draw extended scrutiny to the issue or any other breach of authority. Finally, when administration officials began asserting that the president might even have the power to launch drone strikes on American soil, Senator Paul decided he would hold up a major nomination to command the attention of the entire country. Many of us sat back and watched the impassioned speeches from Paul and the stirring words of Ted Cruz. We wondered why we had not witnessed this sort of spirited opposition during Obamacare. Yet that is exactly the point. Most of these senators are new to Washington. They have charted a new path forward, one that is not paved with backroom deals but with forthright demonstrations of courage and commitment to the principles that buoyed them into office. Instead of cutting a deal to invoke cloture and having Brennan’s nomination sail to confirmation, Paul has united a fractious Republican Party against this – that is everyone except for Obama’s dinner companion Lindsey Graham. Republicans have repeatedly entreated us to the tired bromide that they only control one-third of one-half….. What these banal bulls of Washington dealmaking don’t understand is that with complete control of the House and a filibuster strength minority in the Senate there is a lot they can do. With the ubiquitous nature of C-Span and social media, Republicans can use critical leverage points to seize on winning issues and put Obama in the defensive position. That’s why yesterday’s act of cowardice on the CR in the House was so incomprehensible to many conservatives. Even if they planned to ultimately cave on Obamacare to avoid a shutdown three weeks from now, why not initially bring it to the floor under an open rule and debate Obamacare for a few days? Let’s at least draw attention to the injustice of Obamacare at a time when many people are feeling the pain of higher insurance premiums. We are also told that the juggernaut of a biased media is too powerful to overcome were we to force some sort of a dramatic battle over critical issues, such as Obamacare or illegal immigration. It’s true in fact that the media is incorrigibly in the tank for the left, and there’s nothing we can do about that. But one thing about the media is that they are impressed by a show of force and stimulated by something new and exciting. 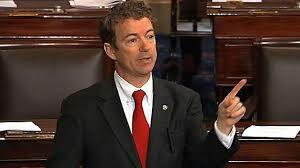 Rand Paul proved that last night, as even some mainstream media reporters gave him positive coverage. When the CR comes before the Senate, conservatives should hold it up at least for a day or two to educate the American people on the ramifications of funding Obamacare. When the nomination of the new radical nominee for EPA director comes before the Senate, they should take turns launching filibusters into the night, educating the public on how that agency has cost jobs and raised the cost of living on the working class. They should draw attention to onerous policies like ethanol mandates. We didn’t send Republicans like Mitch McConnell to Washington to cut backroom deals and to passively and blithely ignore the injustices that are perpetrated by the statist class on a daily basis. Nor did we send Republicans to Washington to echo those injustices, like John McCain and Lindsey Graham do on a daily basis. It’s no coincidence that this effort was initiated by the disciples of Jim DeMint. And with the 2014 election cycle beginning now, it’s incumbent upon all of us to help send reinforcements to the ranks of our fighters.